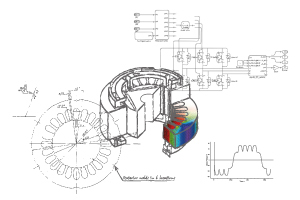 JMAG is simulation software for electric device design and development. It accurately models the complex electromagnetic phenomena in a wide range of equipment. Since being released in 1983, JMAG has been used in industries and universities world-wide and has contributed to the development of thousands of products. Continuous communication with our users has made JMAG a world class analysis tool. It is our wish that JMAG continues to grow and develop with its users. This is the high-speed, high-precision FEA software tool at the core of JMAG. An intuitive interface and precise modeling technology with a wide variety of results displays are built in. Multifaceted evaluation of various design ideas is made possible by freely manipulating geometry, material properties, and drive conditions. JMAG-Express is a motor design tool. Instantly calculates the motor performance as a calculator and provides design sheets to meet its requirements. It enables to review all design changes accumulated in JMAG-Express at any time just as though you were referring to design memos. JMAG-RT generates a high fidelity plant model. Since the model is still numerically based, it can solve very quickly. And since it is based on Finite Element Model results, it will not sacrifice accuracy to achieve this calculation speed. The JMAG-RT plant model can be used in system level simulations to provide a more accurate representation of the electromagnetic device. The JMAG-RT block can be used in Hardware in the Loop Simulations (HILS) which connect a physical Electronic Control Unit (ECU) to a virtual motor.